I love hearing stories from people who have been in the presence of great saints, like Mother Teresa or John Paul II. People say things like, “When we talked, nothing else seemed to matter to him,” or “When he talked to me, I felt like I was the only person in the world.” This ability to be really present with people is a true characteristic of holiness. And what gives the saints the ability to really “see” people? Prayer—spending time in the classroom of silence. Several years ago, I considered becoming a Franciscan friar, so I visited a religious order. I had never met a more joy-filled and loving community. One priest in particular was able to be so present to me that he seemed to read my soul. He truly listened and understood me. It is no coincidence, I think, that this order—though having a mission to minister to the poor—was also so focused on prayer. In addition to daily Mass, they prayed the Rosary and other prayers several times throughout the day. They spent an hour a day in Adoration, and even had a full day of silence once a week. It was in this classroom of silence that they learned to be present to God, and in turn, be present to others. 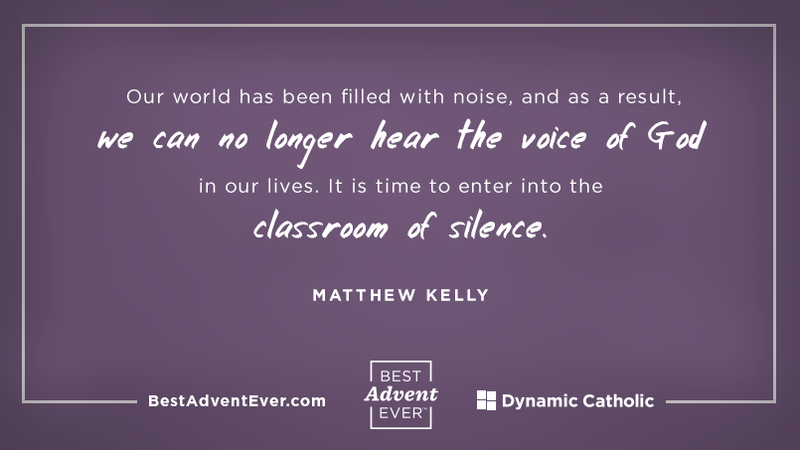 In the classroom of silence, we discover who we are and the Father’s love for us. When we have his love, loving others doesn’t seem like a chore, and we want to share the love we have received. Do you have the ability to really see people? Spend 15 minutes in the classroom of silence praying Saint Francis’ simple prayer to the Father. Who are you, Lord? And who am I?